"Bird In The Hand" 39" x 22" Oil on panel. "Transparent Joy" 32" x 32" Oil on canvas. 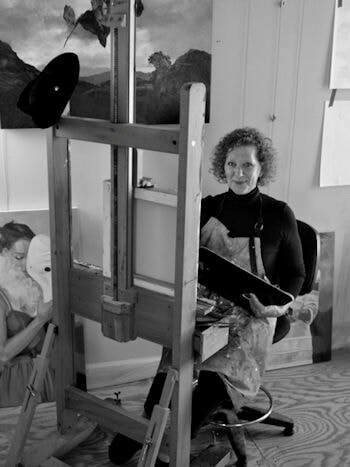 ​Lesley Thiel is a self taught portrait artist known for her highly detailed photorealistic paintings. Her style and choice of subject relies heavily upon her love for the beauty she perceives in all living things. She works in oils, either on canvas or panel. Her paintings have been included in numerous exhibitions in the UK and elsewhere. Her work is represented in collections throughout the world. Several pieces of her art were displayed at Terminal 5 Heathrow Airport as part of an exhibition to welcome visitors to the UK during the 2102 Olympics. Recently, her painting ‘Moonchild’ was chosen as one of ’50 Great Figurative Artworks 2017’ by Poets & Artists Magazine. She also received a Certificate of Excellence from the Portrait Society of America in 2015. She was born in England, but has spent much of her life living in Europe and in the United States. She now lives and works in North Carolina. PoetsArtists Magazine issue 91. The art and poetry of 'Visions Of Venus'. ​The Guide Artists Issue 11 pages 47 - 59. Cover story with interview. 'Moonchild' selected as on of '50 Great Figurative Artworks 2017' by PoetsArtists Magazine in their issue 89, curated by Steven DaLuz. "Moonchild" 32" x 24" Oil on canvas.